Are you a fan of Pahang FA Fila? One of the best ways to show support to this dream league soccer team is downloading their team kits and logos 2019. Search no more for procedure on how to access kits and logo of Pahang dream league soccer, we will provide easy ways for you. Based in Kuantan, Pahang is a Malaysian professional football club known as the Pahang Football Association. It has represented their region when founded in 1959 and the yellow kit is the traditionally worn. Early home matches of this dream league as startups are mainly held around Pahang districts, outside Kuantan or around the city public fields. From Pahang FA, the name was changed to Pahang FC by PBNP during the early 2016. It was later changed back to the original Pahang FA on December 2016. 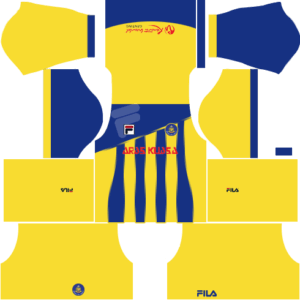 Yellow and blue are the dominant official colors of this home kit. It comes in 10 pieces where you can have the design for your dream league soccer team. It also comes with the official Pahang FA and Fila logo which make it look authentic. 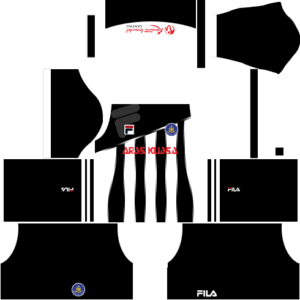 The dominant color of the Pahang Fila Away Kit is black and has white strips as secondary color. The design is similar wit the home kit and comes with the official Pahang FA and Fila logo. When downloaded, your dream league soccer team will surely love this!. The Pahang Fila GK Home Kit has only one official color, black. This is another additional kit where your soccer team is excited to have. Download this unique kit and comes authentic with the official Pahang FA and Fila logo. Comes with a cooling light blue color, the Pahang Fila GK Away Kit is another exciting addition to your collection of Pahang FA Fila kit. Start aiming high for your dream league soccer team! With the Pahang FA Fila logo and kits, your soccer team will definitely get inspired and kick their way towards winning. Download them today!